We are in love with Tiny Hands Food Jewelry, scented food jewelry created by Mei Pak who combined her love for miniatures and food. This unique jewelry is perfect for your adorable little one or any woman who just loves creative and fun pieces. Each piece is shaped like your favorite sweet treats from cupcakes to donuts to waffles to lollipops. There are even fortune cookies, macaroons and bacon. Yes, we said bacon. Tiny Hands Food Jewelry sent us two of their most popular pieces, the lollipop and the waffle necklaces. The lollipop necklace has a subtle scent like a real lollipop and is full of beautiful rainbow colors. The waffle jewelry has a stronger sweet scent that makes this unique piece as delectable as it is cute. In addition to necklaces Tiny Hands Food Jewelry has earrings, rings and bracelets. Although they have a plethora of amazing options, they will custom make a piece just for you. Each piece is handmade by Mei herself. Our tiny beauty expert had this to say about the lollipop and waffle necklaces. 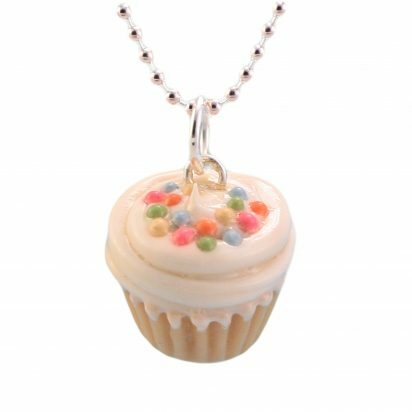 Get a taste of these fun jewelry treats at https://tinyhandsonline.com/.